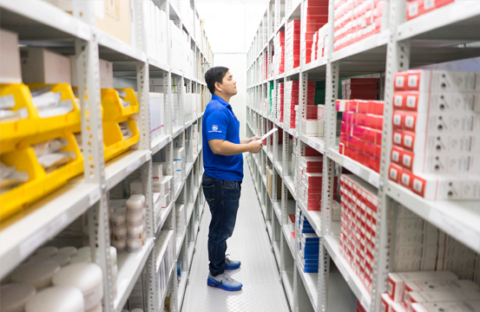 One reason for Medica Group's success and excellent customer service is our first-in-class logistics centered around our warehouse and the people working there. Every day we strive to improve our flexibility, reliability, and efficiency to make sure our products are delivered safe and on time. We know that getting our products to our clients on time is the first step to good and long-lasting ties with our partners. That’s why Medica Group invests in keeping our warehouse up to date with the latest technology, creating a safe environment and educating our people. People are our greatest assets and we know, that without their hard work on the ground, we would not be here. We are proud of having a strong and dedicated workforce that comes to work every day to make sure you as a partner will experience flexible, reliable and efficient service. Today, we have more than 20 people working to make a difference in getting the products to you. Our warehouse are monitored all the time to have top conditions for both people and products. We will not be able to provide this kind of service with having the right surroundings to keep our products safe and well organised. After 16 years of experience in the medical and aesthetics industry, we have built strong and dynamic procedures that make sure we, as a company, can provide safe, flexible and on time delivery.